According to a recent story from CNN online, Florida’s Caladesi Island topped the 2008 list of America’s top beaches compiled by “Dr. 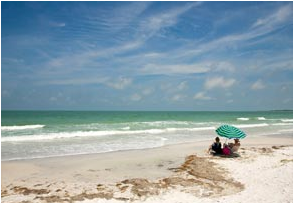 Beach” — Stephen P. Leatherman, a Florida International University professor. While our beloved Bay Head, New Jersey, didn’t even make the list, Caladesi beat out beaches in Hawaii, along the Eastern Seaboard, and in California for this year’s honor. The runners-up on Leatherman’s list of best beaches this year were Hanalei Beach, Hawaii; Siesta Beach in Sarasota, Florida; Coopers Beach in Southampton, New York; Coronado Beach in San Diego; Main Beach in East Hampton, New York; Hamoa Beach, Hawaii; Cape Hatteras, North Carolina; Cape Florida State Park near Miami; and Beachwalker Park on Kiawah Island, South Carolina.